Ryan Ciotoli, one of MMA's finest trainers, has put together a fine fight card in upstate New York. The event will be held at Cattarugas Sports Arena in Irving, New York this Saturday September 22. The main event is a great match up between two very talented fighters, Don Carlo-Clauss and Eddie Fyvie. This fight is going to be war. For more info, check out the Gladius Fights website. Warriors Cup XV: Rahway, NJ, September 29! The Warriors Cup returns on September 29, 2012, at the Rahway Rec Center in Rahway, New Jersey! Fans have been waiting for this event, and as always, it promises to be an explosive night of Muay Thai action. New Jersey is the only place on the East Coast to see WBC-sanctioned professional Muay Thai, so don't miss your chance to see some of the best Muay Thai available in the United States. Muay Thai is one of the premier striking arts in the world, and it is studied extensively by mixed martial artists. Knees, elbows, feet and fists are all in play in a Muay Thai fight, which makes it one of the most exciting combat sports in the world. I am thrilled to be a part of this show and will be hosting the event from inside the ring. Come join me at the Rahway Rec Center on September 29 for a full night of professional and amateur Muay Thai. For ticket info, visit the Warrior's Cup website. This is Muay Thai!! Ever wanted to work as a cutman? Learn the ins and outs of the cutman trade by attending Steven Katz's on Saturday, June 9 at Renzo Gracie's new academy in Brooklyn, NY. The address is 100 Bayard St, Brooklyn. Cost is 100 bucks. If you need gauze and tape, it's just 15 dollars more. You read that right. New York is getting its first sanctioned MMA event in the state, despite MMA still being illegal. It seems there is a loophole in the law that allows amateur MMA events to take place. And now that loophole is going to be put to test when TNT Fight Series puts on their event in North Tonawanda, NY on May 19. There have been MMA events in New York, but only on Indian Reservations. This event is not on a reservation and it could lead to more events taking place all over the state. It remains to be seen if politicians will try to prevent the show from happening. We'll keep you posted. 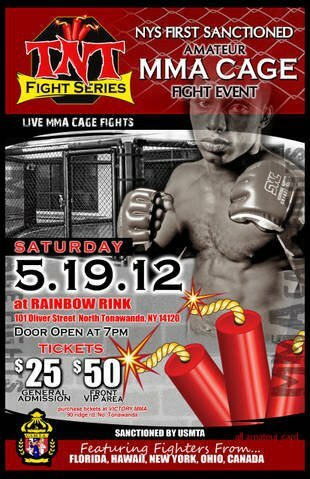 I heard about this event from NY MMA Now, a great website dedicated to the legalization of mixed martial arts in New York. Check it out. 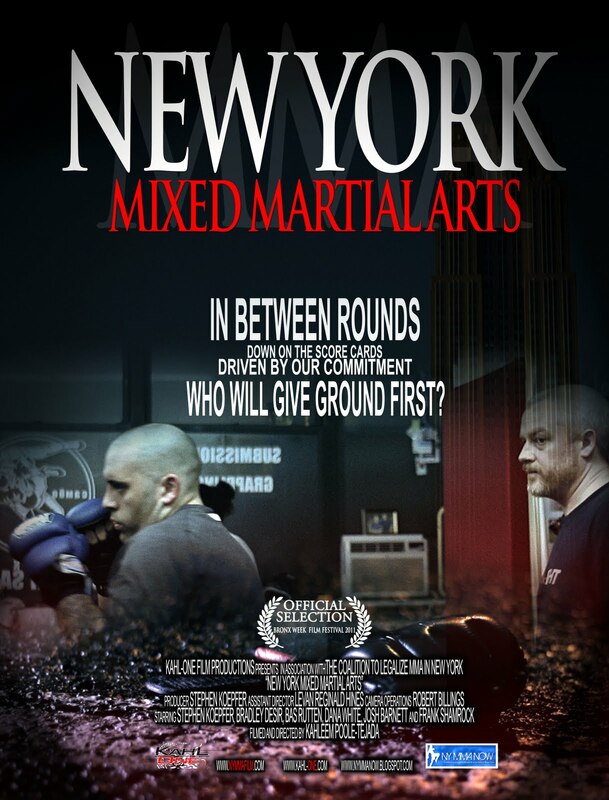 Mixed Martial Arts in New York: Lift the Ban! On March 6th, a rally was held in front of Governor Andrew Cuomo's office in Manhattan in support of legalizing the sport of MMA in New York. Organized by "Sambo" Steve Keopfer, the rally was attended by MMA fans frustrating with the ban. MMA's premier videographer, Kahleem Poole-Tejeda was also on hand to document the event. Hopefully, the rally showed Governor Cuomo how dedicate fans and MMA practitioners are, and how absurd it is to keep the sport illegal in the state. There is a huge financial upside to legalizing the sport, and it's sad that New York, a world leader in just about everything, is so far behind the times when it comes to mixed martial arts. Check out the video of the rally, and read below to see how you can help get MMA legalized in the state of New York. Ben Syers gained a measure of Internet fame as a fighter when he knocked out Bobby Ascolillo in just 4 seconds to win the Evolution Fighting Championship's 140 pound title. It was a spectacular KO, and the video went viral, resulting in tens of thousands of hits in just a few days. Tomorrow night, March 17th, Ben will be fighting Luis Finateri on Lou Neglia's Ring of Combat AMXII show at the Rahway Rec Center in Rahway New Jersey. After winning the Evolution title, Ben suffered a shoulder injury in training, and when he returned to action he lost a decision, and his belt, to Caleb Solano at another Evolution show. But now he's in perfect health and is ready to make a statement at Lou Neglia's event. "I'm ready," said the 23 year fighter old fight East Meadow, Long Island. "I feel good. I'm excited. I feel 100 percent healthy...stronger, faster, sharper. I'm ready to perform." Syers is a fierce competitor and the loss to Solano has inspired him to train even harder. 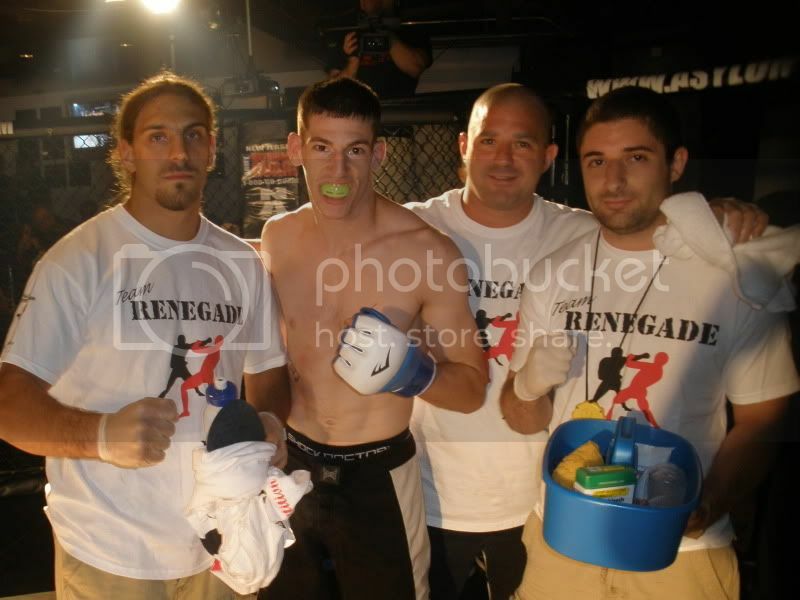 He fights out of the Team Renegade camp in East Meadow, and is trained by international Sambo champion and former MMA fighter Anthony Sansonetti. Ben sees this fight as a crucial step in his MMA career. "I see this as the most important fight or competition of my life right now," he said. "Which just makes it that much more exciting for me. It's a whole new fight, a whole new story for me. I'm ready to win this and move on to the next chapter of my fighting career." Ben has been working on adding more weapons to his already impressive arsenal, and will be looking to display them tomorrow night. I asked Anthony Sansonetti about what he's been working on with Syers. "He's working on his core skills, his jab, his hook right, his uppercut," Anthony explained. "He's keeping focused on the distance between him and his opponent, always knowing where to be. But also he's been adding in some more kicks and some more tricks...jump knee to the body, spinning back fist. So he's got some more tricks." These little extras will serve Ben well in future fights. But of course he and Anthony continue to work hard on the basics. Indeed, it was a classic left hook that KO'd Ascolillo in the fight that went viral on the Net. I asked Ben about that video, and about how all the attention affected him. "It didn't really affect me," he said. "I can't remember the last time I watched it. I'm always looking to get better and move forward and win." Thanks to the video, Syers is now known for his punching prowess, but he really got his start as a wrestler. His wrestling is what eventually led to him become an MMA fighter. "I wrestled all throughout high school and a year of college," he said. "I love competition and wanted to try something new. Started watching the UFC and here I am." In fact, when Ben first started training with Sansonetti, the plan was to rely on his wrestling skills in the cage. But Anthony soon realized that Syers was a very talented striker. "He told me he wrestled," Anthony said. "It was his strongpoint, so I thought when he fought MMA a good strategy would be to take people down and ground and pound them. He has good conditioning, good takedowns, and I figured that would be the way to go. But I was afraid that in his first fight he'd panic as soon as his opponent started throwing, and then telegraph his shot and either get caught in a submission or just be sloppy. So I tried to make him get comfortable with his standup, with his boxing, and his hands. We were really focusing on it. Then one day I remember I was watching him spar, watching him move, and thought, wow, he's gotten really good at boxing. So we changed his strategy. It has really developed as a skill set for him." Now Ben goes into each fight with the confidence that he can end a fight with just one punch. But he doesn't go in there looking specifically for the knockout. He mixes his stand up techniques and wrestling very well. Plus, he's developed some excellent Sambo skills, which serves him well in the cage. "Sambo helps a lot," he said. "In terms of the aggressiveness, throws and takedowns." Sambo is a great art for mixed martial artists. The legendary Fedor Emelianenko can attest to that fact. "He's got a good uchi-mata, or pod vat, in Sambo terms," Anthony said. "It's not something that he used in wrestling, especially up high in the clinch. Now it's a good counter for him." With these well rounded skills, Ben Syers is looking to the future and will be going pro soon. He has a dream. "I will make it to the UFC one day," he says with absolute conviction and confidence. Given his work ethic and ability to learn, it's hard to doubt his words. Ben Syers is a name you will be hearing a lot in the future. Expect to see more viral videos of him as his career develops. Please don't miss tonight's great charity event at the Plattduetsche Part resturant in Franklin Square Long Island. There will be an action packed night of boxing and kickboxing, as well as raffles and many other fun ways to raise money for a kids in need. I am hosting the show, and I am pumped for this event. If you love combat sports and want to help the kids who need your help, here is a golden opportunity. There will be VIPs in the crowd, including former UFC champion Matt Serra. Come on down to Franklin Square and enjoy a great night with a great mission! Click the link for ticket info and check out the website: JackFightsforKids.eventbrite.com. Here are the details. Let's all support this very worthy cause, and show up in big numbers for this exciting and important event. An evening of ametuer fighting with general admission doors opening at 7:30pm. Raffles, auctions and other activities will take place during the evening. Drinks will be available for purchase. Access to the private VIP Cocktail Hour and Hors d'œuvre starting at 6:30pm. Long Island MMA is one of the East Coast's premier MMA schools, and it's home to UFC fighter Dennis Bermudez, Strikeforce fighter Ryan LaFlare, and other rising stars. Run by Gregg DePasquale, who is the BJJ coach for the school, Long Island MMA is doing great things for the sport of mixed martial arts. I was at the school the other, and in this video I talk with Gregg, as well as NCAA wrestling champion Gregor Gillespie, who will be making his MMA debut in May in the Pro-Elite promotion. This Friday, March 9th, on Long Island, there is a kids' charity event taking place that will feature many cops and firemen duking it out for a great cause. There is a full card of kickboxing and boxing action scheduled, and I am honored to be doing the ring announcing. Attending the event will be some very special VIPs, including former UFC welterweight champion Matt Serra. NY MMA Rally Tomorrow March 6, 2012: Support NY MMA! NY MMA Rally March 6: Support the Legalization of MMA in NY! KahL-One's NY MMA: Airing on iPPV October 21!! Jennie Nedell's Fundraising Kickboxing Event: Big Success!